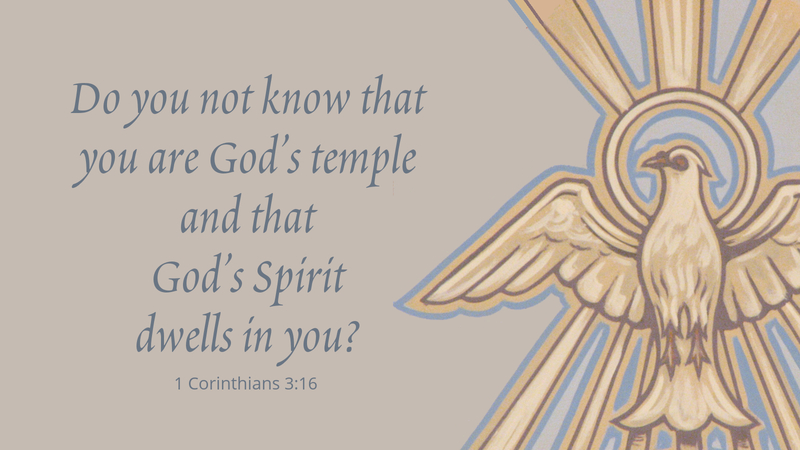 “Do you not know that you are God’s temple, and that God’s Spirit dwells in you? … For God’s temple is holy, and that temple is you” (1 Cor 3:16, 17b). No, most of us do not know that we are God’s temple and that God’s Spirit dwells in us—so that our bodies are holy, as God is holy. We may say it and acknowledge that Scripture teaches it, but when it comes down to how we live our lives and what we do with our bodies—we prove that we do not think of our physical selves as God’s holy temple. When Christians truly know this and believe it, it shapes our lives in ways we cannot even imagine. Our diet, our exercise routine (or lack thereof), our habits, our sexual behavior all will be affected by knowledge and belief that our bodies are God’s holy temple, with the Holy Spirit dwelling in us. And this is no self-help, self-improvement scheme—it’s God’s intention for our lives—for holiness and healthiness of our body, mind and spirit. Because God has created us and redeemed us for Himself, we no longer belong to ourselves. We are God’s handiwork, created while we were still in the womb to be His children. As you journey through Lent, might this be a good time to consider how your life might change/be different, if you came to know and believe that you are God’s holy temple? What would you do differently? Stop drinking so much? Change your eating habits? Begin to exercise more regularly so that you are healthier, have more energy, and are more capable of worshiping and serving God with your whole life? What support and encouragement would you need to begin to make such changes? Are there those who could help and strengthen you as you seek to treat your body as a temple of the Holy Spirit? As you consider these questions, and changes in life, be assured that God loves you and cares for you as you are—but He loves you so much that He won’t leave you that way. God wants for us healthy, whole and happy lives. God sent His Son to prove His love for us. God raised His Son from death so that we might know that in Him we have newness of life—that in Him and with Him, our lives can be new and different! Prayer: Lord our God, give us courage to live as if our bodies are temples of your Holy Spirit; through Jesus Christ our Lord. Amen.